This week I presented our research on hospital pharmacists interweaving safety with health information technology at HIC 2018 (HISA Health Informatics Conference, Sydney, 29 July-1 August). The paper was shortlisted for the Branko Cesnik Award. Interweaving safety work enables to improve medication safety with digital technology, during ongoing patient care. This work is distributed across the staff of a pharmacy team, from pharmacists to technicians, support workers and even delivery teams, and it is done with a variety of digital systems involving supply and use of medications. Below is Table 1 with more details than the one published in the proceedings, which had to be cut for formatting purposes. This website began with a Marie Curie fellowship, an award to study mindfulness and technology in Australia, Europe and the UK. These global fellowships are prestigious and a great honour. They are also a personal and professional journey, taking the researcher for two years to another country, to learn from other organisational contexts and cultures. There is no much time for a proper diary, but to celebrate and remember this journey of learning, I will try to annotate brief quarterly summaries. Click on the category A DIARY to filter these posts. Images: © Valentina Lichtner, 2018. 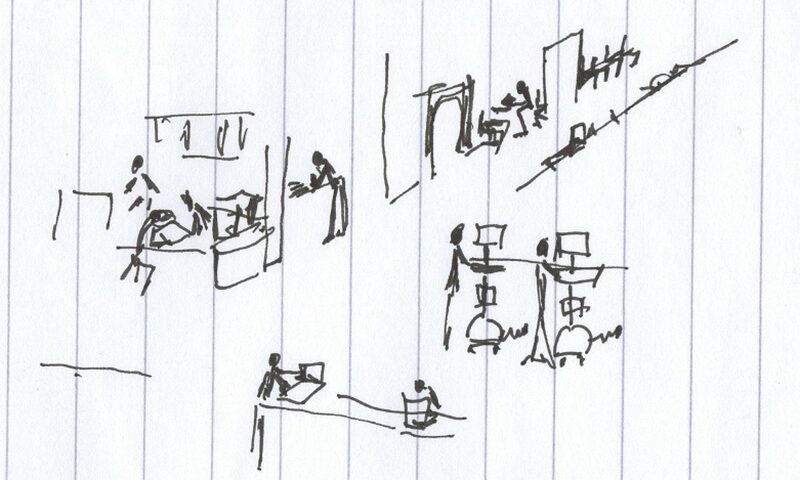 Drawings are from ethographic studies of NHS settings, activities of people and information technology.